Because of the difficulty of fully decontaminating a boat that has been in a waterbody infested with zebra mussels or other invasive plants or animals, it is best to avoid introducing a boat into Candlewood or Green Pond that has been in an infected water body anytime within the current boating season. If this can not be avoided, then there are a number of critical steps that need to be taken to avoid introducing zebras or other invasive species into Candlewood or Green Pond. Basically, these steps include "Clean, Drain and Dry". Note that to be effective, the needed drying time during the boating season to kill off zebras or their offspring can be up to 29 days- meaning that if you boat in an infected lake, it may require as long as 29 days before you can safely launch your boat into Candlewood or Green Pond- all the more reason to stay away from infected water bodies altogether and not risk infecting Candlewood or Green Pond. Although we know that the water chemistries of Candlewood would likely support zebras, we're not sure about Green Pond at this point. Until we can determine if Green Ponds water chemistries could support zebras, it is better to err on the side of caution and take steps to prevent the introduction of zebras into both waterbodies. When traveling from one body of water to another, especially a body of water with a known infection, you should always inspect your belongings, equipment and watercraft when you leave. You should then clean, drain and dry your property and then inspect it again before you launch in another body of water. Watercraft surfaces that must be checked: entire hull, deck, transom wall, motor, motor cooling system, live wells, ballast tanks, bladders, bilges, lower outboard units, lights, pilot tube, depth sounders, trim tabs, depth transducers, water intakes and outlets, propeller, propulsion units, all water systems using lake water (a/c, personal sanitation, wash down systems, if installed), filter screens, pumps, valves, trolling motors, centerboard trunk, rudder, transom, keel and fillings. Trailers and Tow Vehicles – Check all surfaces in water contact: frame, axles, license plate and holders, lights and wiring, fenders, hangers, tires and wheels, rollers and bunks, springs, pockets and hollow spaces. Seaplanes - All surfaces in water contact. 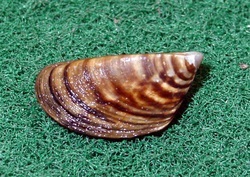 Zebra mussels can survive out of water for varying amounts of time. Cool, damp weather allows them to survive longer than when it’s dry and hot. Here are the days of drying time, by month, recommended to insure that they have died. This is especially important when you are traveling from an infected body of water to one that isn’t.